Tell us about your brand. What do you feel sets you apart or defines you? I’m not sure if it sets me apart but I’m not afraid to try new things, in fact I really love it. Some brands are known for the one thing they do really well but I feel like my fans love the fact that I always have an array of finishes in my stores. 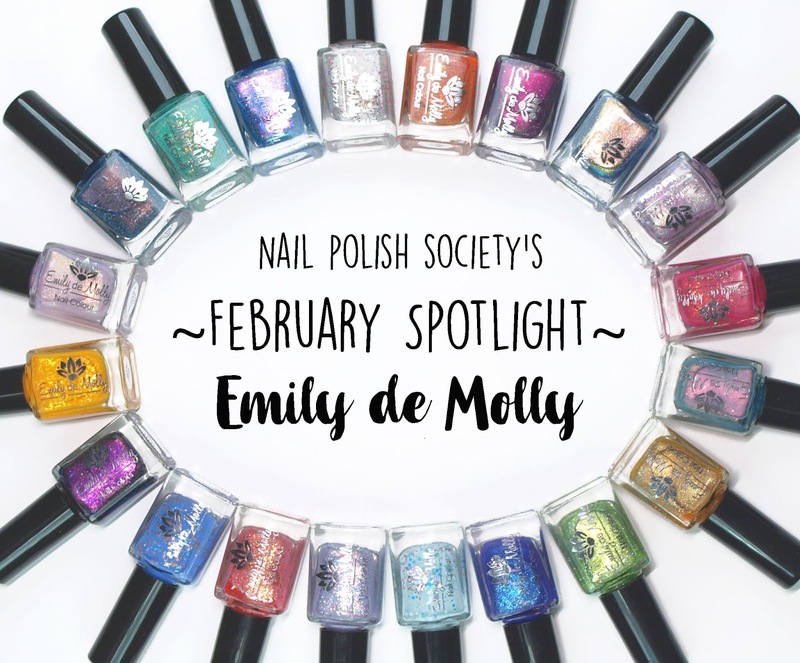 Where did the name Emily de Molly come from? Unfortunately Emmy passed away a little while ago now due to a few health reasons associated with her old age. I’m so glad I named my business after her, she was truly special and will be remembered always. Molly was the name of one of my best friends dog, and it was her husband who came up with the combined name of Emily de Molly during a brain storming session. My friend and I often joke that she deserves some sort of royalty for her help in the name department. When did your love for polish begin? It started when I was a child but I really remember loving it when I was a teenager. I was constantly painting my nails back then. I would probably have to attribute this love to my mother who always had beautifully painted nails. How did you make the leap into creating your own brand? When I really got into polish, money was very tight. I thought making my own would be a cheaper alternative to buying all the polish. I would post my creations on Instagram and people started telling me they would love to buy it, it just grew from there. I have always been the creative DIY type, so it was not far out of my comfort zone. Are there advantages/disadvantages to being an Aussie based brand? There are definitely disadvantages. Shipping is expensive within Australia and its really hard to send polish out of the country now due to customs regulations. This is why I sourced a USA based warehouse so I could still continue to share the love internationally. As for advantages, we have an amazing community here, it may be much smaller than others but they know how to show their love and support for local makers. Your polish names are always unique. Where do you come up with them? I find naming to be one of the hardest parts of my job! I have a list of names that I keep on my phone, anything that I hear or see that takes my fancy, I add it to my list. When it comes time to name a polish I just go through my list and see what I think fits. Do you have a dedicated space for your polish making? Can you tell us about it? Yes, I’m lucky enough to have the spare room. I kind of out grew it quite sometime ago but I have to make it work until I can find a bigger area. Creating new colours, I love it. This can also be creating new colours. Some days I can be in my work room for hours and make absolutely nothing I love. It can be really frustrating when things don’t turn out as planned. Was there a specific polish or collection that “put you on the map” so to speak? Cosmic Forces! So many people wanted that polish. Its a colour I almost didn’t release because it does require some effort to use but I’m so glad I did. What was your most popular shade of 2018? Sea of Lies was very popular last year! Can you pick a favorite shade of yours? What can we expect from you in the future? Are there any goals you’re aiming toward? I’ve been working on a gel range for quite some time now. I find this more challenging to formulate than regular nail polish though, so its taking awhile to finalise. I’m hoping to have some colours ready for launch in the next few months. I would also love to branch out into physical stores ( local boutique type places ) but its a matter of finding the time to implement these things. *I was a long time admirer of Emily de Molly before I ever got my hands on any. I was first drawn to her glitter jellies because I had never seen them done so well. Thank you Hayley for taking the time to give us a little look behind the scenes! I hope you all enjoyed getting to know a little more about her as much as I did!